The crowded world of IoT groups has been joined by a new player - the Avanci Alliance. Set up by Ericsson, Qualcomm, InterDigital and KPN, and now joined by Chinese technology company ZTE, Avanci is licensing its members patented wireless technology via a single license on fair, reasonable, and non-discriminatory (FRAND) terms. The aim of the Avanci marketplace is to allow faster time-to-market for IoT companies and will drive the adoption of connectivity around the globe and highlights the maturing of the market. Avanci will focus its initial licensing efforts on 2G, 3G and 4G cellular technologies for connected cars and smart meters with plans to quickly expand to other IoT product areas. “The one-stop licensing model of this platform will significantly increase the cost predictability and transparency of IPR licensing to meet the rapidly growing demand of connection service providers,” said Spencer Shen, the CIPO at ZTE. “Avanci will enable IoT manufacturers to conveniently get the world’s most advanced wireless technologies, so they can scale quickly, shift more focus on the marketing of new IoT products, and finally accelerate the development of IoT globally,” he said. ZTE, the only Avanci member from China so far, is known for its future-oriented development efforts. In has a range of 4G, 5G and IoT patents, with over 815 that are part of 4G LTE. It also has nearly one thousand patent applications involving key 5G technologies. An IoT patent report released by consulting firm LexInnova shows that in 2016, ZTE was one of the top three companies. A report from the Intellectual Property Office of the UK shows that ZTE topped the list of IoTpatent holders from 2004-2013. In the next few years, the number of sensors, appliances and machines connected to the IoT will exceed that of phones to become the biggest category of connected devices. By 2021, nearly 16 billion devices among the 28 billion connected devices globally will be IoT devices, including smart-city devices, smart cars, smart home devices, as well as mobile devices for healthcare and diagnosis. However, the Fair Standards Alliance (FSA) has called for Avanci to engage across industry to ensure its new licensing platform is a real success. So what on earth is JEFF and the Bouncy Castle? Turns out, JEFF's a file format that gets around many of the problems of using Java in real time embedded designs, especially for the Internet of Things (IoT). Developed around 2002, it brings everything into one file and optimises it for memory space. This means that it can run on any Java virtual machine (VM), and these have got a lot smaller in the intervening years. It also means that embedded projects can use Java libraries and developers - and both of those have grown tremendously over the years. It also helps provide key security libraries such as Bouncy Castle to add more security to an IoT design. Bouncy Castle is a lightweight open source cryptography API that makes securing IoT devices easier. When you tie that up with VxWorks' links to IBM's Watson supercompuer-based data analytics service in the cloud, it starts to look very interesting. Silicon Labs has used the Gecko low power wireless technology it acquired with Energy Micro to develop a family of modules that support Zigbee and the Thread IoT protocol. The MGM111 module is the first in this comprehensive family of multiprotocol modules based on the Mighty Gecko system-on-chip (SoC) device. The MGM111 module is supported by Silicon Labs’ mesh protocol stacks and wireless software development tools. The module’s combination of onboard stacks, antenna options and RF regulatory certifications helps developers reduce cost, complexity and time to market for an array of mesh networking applications including home and building automation, connected lighting, smart metering, security systems and other IoT platforms. The MGM111 module combines a 2.4 GHz Mighty Gecko SoC, high-efficiency chip antenna, crystals, and RF matching and shielding into a complete, ready-to-use mesh networking module supporting ZigBee and Thread protocol stacks. This high level of integration frees developers from complex RF/antenna design and testing and allows them to focus on their end applications. The MGM111 module complies with the IEEE 802.15.4 standard used in ZigBee and Thread stacks and will be pre-certified for compliance with the following regulatory requirements: FCC (North America), IC (Canada), CE (Europe), RCM (AU/NZ) and KC (Korea). Silicon Labs has shipped more than 100 million mesh networking SoCs and modules to customers worldwide. A long-time member of the ZigBee Alliance, Silicon Labs is the leading provider of silicon solutions running ZigBee PRO mesh networking software. In addition, Silicon Labs is a founding member of the Thread Group and has been instrumental in defining and developing the Thread software specification. The MGM111 module comes in a compact 12.9 mm x 15 mm package that is footprint- and pin-compatible with Silicon Labs’ BGM111 Blue Gecko module supporting Bluetooth low energy technology. This compatibility eases migration and enables developers to support multiple wireless protocols with a common, future-proven system design. 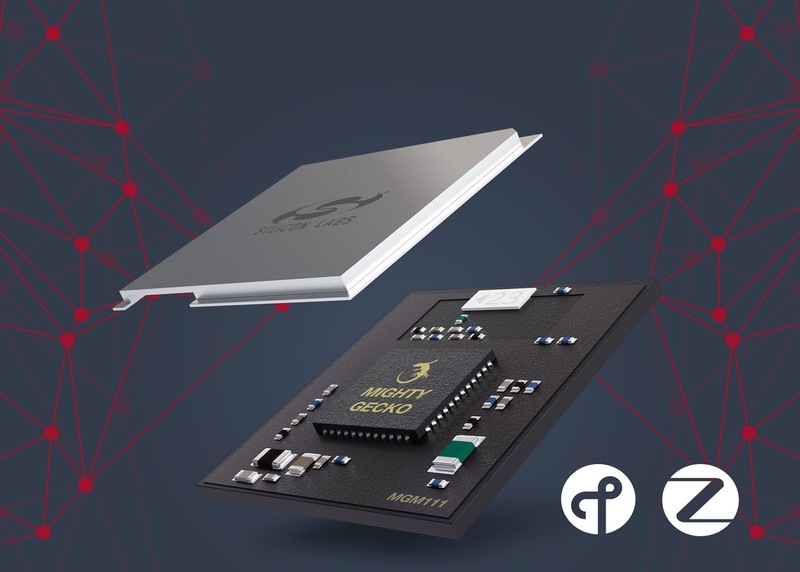 The MGM111 module is supported by Silicon Labs’ Simplicity Studio development platform, a comprehensive suite of development and debugging tools that accelerates IoT product design. Key Simplicity Studio tools include AppBuilder, allowing developers to easily configure wireless applications while ensuring software reuse across designs based on Wireless Gecko technology; Network Analyzer, providing full visibility and debugging of wireless networking activity by using the module’s packet trace port; and Energy Profiler, enabling developers to minimize the energy consumption of their code and extend battery life. The module uses a 40 MHz ARM Cortex-M4 core and 256 kB flash and 32 kB RAM and supports AES, ECC and SHA algorithms with a hardware cryptography accelerator as well as standalone or network co-processor (NCP) architectures. With up to +10 dBm transmit power, the radio consumes only 9.8 mA (receive mode) and 8.2 mA @ 0 dBm (transmit mode). Pre-production samples of the MGM111 Mighty Gecko module are available now for engineering evaluation and prototyping, and volume quantities are planned for Q4 when certifications are expected to be complete. Better known for GPS trackers, wireless specialist Trimble has launched a range of IOT sensors for water monitoring using low power long range wireless. The Telog41 Series of wireless, battery-powered sensors for water monitoring applications using the LoRaWAN specification that is supported by chip designer Semtech and a range of telecoms operators. These can be used to remotely measure and monitor water, wastewater and groundwater systems including water pressures, flows, levels and rainfall volumes. As part of a smart water infrastructure, the Telog 41 Series wireless sensors work in combination with Telog cloud-hosted and on–premise software to allow utilities to more easily and economically deploy wireless monitoring. The sensors extend across a utilities existing monitoring programs for better tracking, measurement and reporting of water usage, sanitary and combined-sewer overflows (CSO/SSO) and flooding, leakage and non-revenue water (NRW). The sensors can be deployed to enable utilities to address many of the significant challenges they are facing due to drought and water shortages, storm events and flooding, budget constraints and environmental regulations. "The IoT for water enables a step change in operational efficiency, compliance and sustainability for the water industry," said Adrian Newcombe, business director of Trimble's Telog solutions. "With the Telog 41 Series of IoT sensors, utilities now have the ability to monitor areas of their network that would have been cost prohibitive to reach in the past. And with the ability to wirelessly report data at resolutions down to five minute intervals, water managers have much deeper visibility into their operations. This is essential for enabling utilities to transform how they operate their distribution and collection networks." 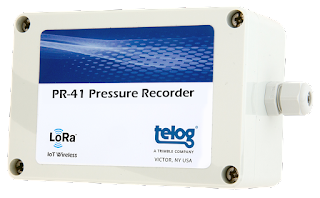 The Telog 41 Series includes five new wireless IoT sensors that monitor key measurements of water, wastewater and groundwater systems, including water system pressures, levels, flow and rainfall. The sensors communicate the data using LoRaWAN technology to Telog software at intervals between five minutes and 24 hours. Using Telog cloud-hosted or on-premise software, utilities have full access to Telog 41 Series monitoring data, including alerts and alarms and advanced analytics and reporting. 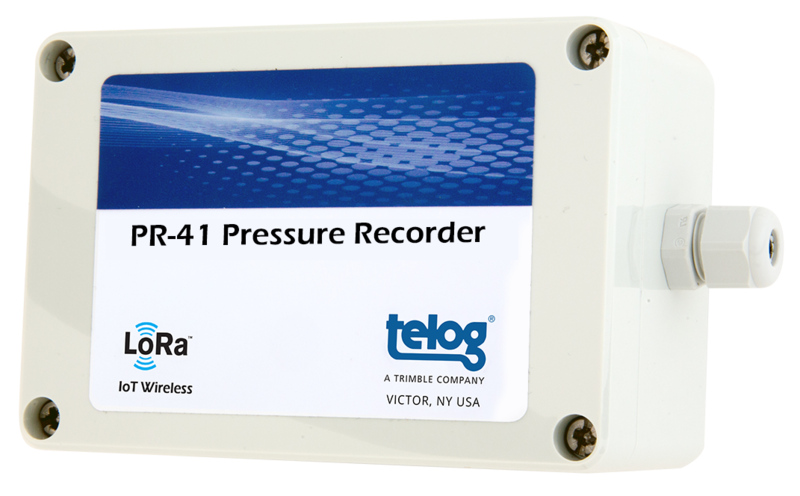 Pressure Monitoring: The Telog PR-41 Pressure Recorder provides utilities with visibility of their water system pressures ensuring that they can operate the network to meet customer needs, regulatory requirements and manage NRW. Level Monitoring: The Telog WL-41 Level Recorder allows utilities to monitor water levels of underground aquifers, reservoirs and water towers, ensuring that they have a real-time view of the water resources available and stored within their network. Flow Monitoring: The Telog MTU-41 Meter Telemetry Unit enables utilities to monitor water flows in their system by collecting the values from a flow meter register and reporting the computed interval flow volume. The Telog MTU-41 ensures that the utility has an up to date view of flows, while improving efficiencies with the elimination of manual reads. Pulse/Event Monitoring: The Telog PE-41 Pulse Event Recorder enables the monitoring of meter devices such as flow meters within the network. By retrofitting the Telog PE-41 to existing mechanical meters (e.g. flow meters) in the network, the utility can gain near real-time data on parameters such as flow that were not previously possible, while driving efficiencies by removing the need for manual reads. Rainfall Monitoring: The Telog RG-41 Rain Gauge allows utilities to continuously gather data on rainfall within their service area. The Telog RG-41 monitors the output of a tipping bucket rain gauge and reports the rainfall intensity so utilities can understand the intensity and distribution of rainfall and its potential impact on their network. The key is low cost of operation relative to traditional cellular remote monitoring products, allowing utilities to deploy sensors in higher numbers and to distribute them throughout their distribution and collection networks, with a battery life of four to seven years from a single, user-replaceable C-size lithium battery. The Telog 41 Series is expected to be available in the fourth quarter 2016 from Trimble's Telog Authorized Partners and Distributors. www.telog.com/Products/LoRaWAN.aspx. Symantec has revealed the top ten passwords for IoT devices. The weak passwords are opening up IoT device to hackers to use a botnets for denial of service attacks. Using root and admin for passwords, along with classics such as '123456' and 'qwerty' leaves devices vulnerable. “For this reason, the prpl Foundation advocates for standards in for manufacturers and developers of IoT - in even the smallest of devices," said Cesare Garlati, chief security strategist for the not for profit prpl Foundation that is backed by Imagination Technologies. "Three basic principles to these standards are using open source - rather than proprietary software, forging a root of trust at the hardware level in embedded systems and exercising security by separation using hardware virtualisation, making it more difficult for criminals to get control." Symantec has confirmed cybercriminals are using the Internet of Things to spread malware and create botnets, hijacking IoT devices to carry out distributed denial of service (DDoS) attacks on more profitable targets, usually large companies. To succeed, they need cheap bandwidth and get it by stitching together a large web of consumer devices that are easy to infect because they lack sophisticated security. This is why security has become a key issue for embedded IoT development projects. “For this reason, the prpl Foundation advocates for standards in for manufacturers and developers of IoT - in even the smallest of devices. Three basic principles to these standards are using open source - rather than proprietary software, forging a root of trust at the hardware level in embedded systems and exercising security by separation using hardware virtualisation, making it more difficult for criminals to get control,” he said. 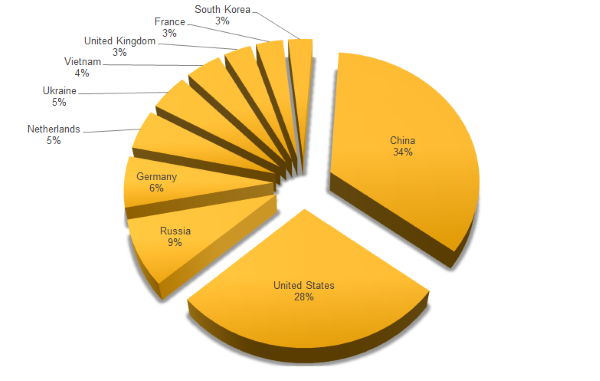 More than half of all IoT attacks originate from China and the US, based on the location of IP addresses to launch attacks says Symantec. High numbers of attacks are also emanating from Germany, the Netherlands, Russia, Ukraine and Vietnam. In some cases, IP addresses may be proxies used by attackers to hide their true location. Although 2015 was a record year for IoT attacks, these are less interested in the victim and the majority wish to hijack a device to add it to a botnet, most of which are used to perform DDoS attacks. A new report on the industrial automation market highlights the top three trends, which, while not overly surprising, are all key drivers for embedded systems. Technavio’s latest report on the global industrial automation software market provides an analysis on the most important trends expected to impact the market outlook from 2016-2020. These have the potential to significantly impact the market as it heads for a shakeout. The industrial automation software market in Asia Pacific is predicted to increase the current market share of 31.46% in 2015 to 33.71% in 2020 from investments in the smart power grid sector, pharmaceuticals, automotive, and food and beverages. Vendors based in Europe and the US are increasingly setting up their facilities in APAC for greater market penetration and to achieve economies of scale. In 2015, Siemens announced investments worth $1bn in India to set up factories and R&D centers in India. Staying close to customers in APAC will allow fast delivery, product customization, and low supply chain costs, increasing the profit margins. Industrial automation software based on the cloud is likely to be a next logical step in the evolution of automation technology in process industries. End-users are becoming more comfortable with the concept of service-based technology architecture. They can significantly reduce costs, achieve greater flexibility, and enhance functionality by shifting toward the cloud-based environment. SMEs operating in process industries face budget constraints and cuts that make it difficult to afford the initial investment in MES. “SMEs are hesitant to incorporate industrial software because they lack the financial resources to employ dedicated technical staff and specialist personnel for complicated roll-outs, updates, and operation of servers. Many cloud vendors such as German-based ITAC Software provides cloud-based MES solutions in the public cloud that can enable SMEs to benefit from the advantages of implementing MES solutions in their plants,” says Bharath Kanniappan, a lead analyst at Technavio for research on automation. The user only needs the standard Internet access, and the cloud service provider supervises the responsibility of installation, configuration, maintenance, and updating. In addition, traditional MES providers offer MES as different modules. Hence, SMEs end up buying multiple redundant modules like Statistical process control (SPC) and Quality or Corrective and Preventive Actions (CAPA), increasing the total cost of the system. An open-source industrial automation software is an independent platform that provides a set of tools for the development and implementation. The open platform-based industrial automation software provides an alternative to expensive in-house design. It offers development libraries, interface applications, mass configuration tools, and front and back-end applications. It supports process and discrete industries that are pressurized to reduce large upfront development costs or quick introduction of new features in connected embedded designs. The existing software modules of open industrial automation software help developers to avoid time-consuming and low-level processes. These modules enable the industrial automation vendors to remain focused on customization of their application and introduce their product in the market as early as possible. Many industrial automation vendors can take advantage of cutting-edge solutions from the open-source community, reap the benefits of crowdsourcing, and avoid costly development efforts. “As automation applications continue to grow, two distinct areas of industrial control systems, namely robotics and motion, are starting to merge deployments. Robotics is a path dependent event-based application. Motion control is typically a scan-based velocity or positioning application. The user interface in robotics is teach-pendent centric and motion control incorporates PLC programming processes such as ladder and FBD,” adds Bharath. Vendors are increasingly finding ways to merge these distinct software architectures to provide a combined software solution to customers. An automated food packaging plant needs a packaging machine and a pick-and-place robot to be installed before it completes palletizing/depalletizing applications. The packaging machines contain motors, actuators, and I/O connections operated by a PLC. The robot is installed with a hand-held teach pendant for programming and operation. Hence, the food packaging firm employs application engineers to complete the PLC programming and a separate application engineer to complete the robot programming. The Internet of Things (IoT) is heading for a shakeout according to anew report from Lux Research. They team at Lux have done a good job analysing 29 players in the market in figure 1, highlighting PTC, although some providers such as SIGFOX are missing. 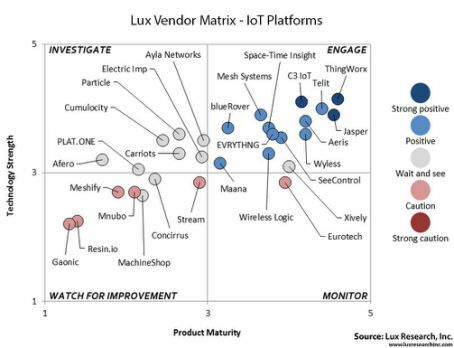 The Lux Vendor Matrix revealed a wide range of companies with technically sound platform products providing broad capabilities across four functional areas -- devices, connectivity, applications, and analytics -- and nine distinct features. Still, a shakeout is imminent, and many startups and small- and medium-sized enterprises are at risk. This concurs with indicators that the hype cycle for IoT providers is reaching its peak and consolidation will follow, although the underlying opportunities for embedded technology remain strong. "In the coming years, most of the strong platform startups will be acquired by large ICT and industrial players, a process already underway, while the majority of the weaker startups will simply fail," said Isaac Brown, Lux Research Analyst and lead author of the report titled, "The IoT Platform Shakedown." "Similarly, enterprise IoT initiatives will achieve mixed results with success depending on how well they navigate a steep learning curve," he said. Tech partnerships are key to platform strength. Nearly all the startups scored between 2.0 and 4.0 in technology strength on a scale of one to five, with a mean of 3.3. The mean of product maturity scores was 3.13 but the range was wider, with many scoring below 2.0 or above 4.0, contrasting with the more closely grouped tech scores. Technology partnerships were the strongest differentiating factor in technology strength scores. Wide range of mature platforms available. The Lux Vendor Matrix revealed a range of platforms with mature and technically sound products, putting them in the upper right-hand "Engage" quadrant. Several of these platforms -- ThingWorx, Jasper, Wyless and SeeControl -- have already been acquired and many more are likely targets in the near future. Overall, with two notable exceptions, platforms with connectivity management capabilities scored higher. Acquisitions top $2 billion in 2016. Venture capital firms and corporate groups have poured billions of dollars into IoT platforms. The 29 platforms evaluated in this study have raised $500 million to date, led by Jasper Technologies with $192.4 million. The value of IoT platform acquisitions has topped $2 billion in 2016 alone. Wind River has linked up its VxWorks real-time operating system (RTOS) client to the IBM Watson IoT platform. This is part of a collaboration between the two to advance IoT deployments for industrial customers with new “edge-to-cloud” recipes designed to simplify and accelerate the development of smart connected devices. This integration marks the first in a series of VxWorks clients for cloud service providers to follow and highlights the need for thinking about the whole IoT chain from the edge to the cloud analytics. The client software allows VxWorks-powered IoT devices to connect directly to the IBM Watson IoT platform. The client is based on the IBM Watson IoT SDK, and enables IoT developers to create devices using VxWorks that can use the IBM Watson IoT platform and IBM Bluemix cloud services. The addition of this client boosts VxWorks as an RTOS for IoT, in addition to the safety, security, and virtualization capabilities already provided to meet today’s development challenges for building intelligent, connected systems. To offer maximum flexibility, different clients will be integrated into VxWorks in the near future to enable customers to choose their cloud provider of choice, which hints at Microsoft Azure and Amazon AWS. Xively, the IoT networking platform of LogMeIn, has launched an interactive design tool to help nearly anyone, even those with limited technical expertise, quickly and easily create a virtual connected product and business. Update: This isn't the first time that LogMeIn has tried to do this - it has been an early mover in the IoT market. Back in 2013 it teamed up with ARM for its Jumpstart service, which brought a series of templates to the mbed development environment to help engineers develop code on ARM microcontrollers and link to the Xively cloud service. This time around, ProductLauncher allows companies to model their IoT project before investing significant time and resources on developing custom software and a physical product. As a result, Xively says 'anyone' can turn an IoT product idea into a virtual connected business that manages and automatesIoT data, all in a matter of clicks. With the ability to move projects forward instantly, companies may be able to dramatically reduce the cost and time to market typically felt with IoT projects. Create an End-User App: A company can see how an app can transform the way product data is visualized and how a user controls various aspects of a connected product. Make Data Actionable: Set rules for the connected product based on the data being generated to help provide new revenue streams, better support or automate the service of the product – all through simple drop-down options. Also today, Xively by LogMeIn is adding new pricing models including a fixed price package that offers a set cost and timeline for getting a product connected and launched, and helps avoid uncertain development delays and cost surges that tend to plague DIY projects. 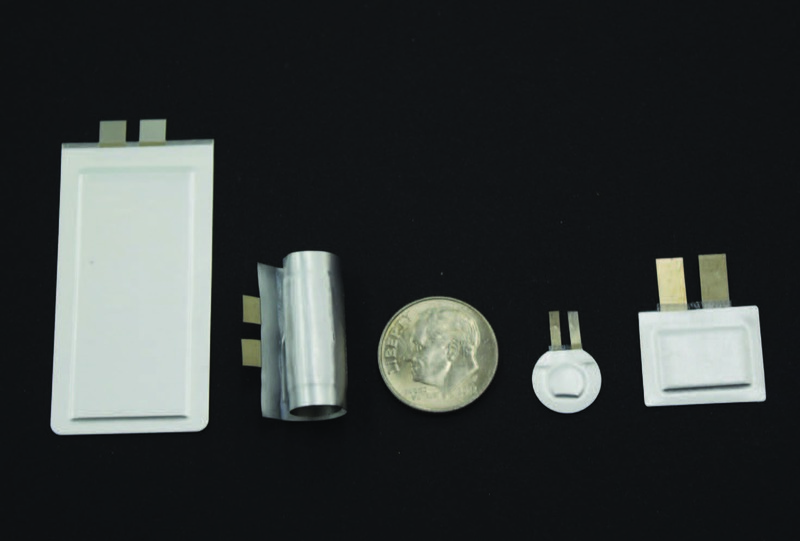 Lithium polymer battery maker BrightVolt is an interesting company for IoT developers. The company is raising over $5m from a venture capital firm called New Science Ventures to move its flexible battery technology into the Internet of Things. The thin film solid state battery technology, Polymer Matrix Electrolyte (PME), can be used in reflow PCB manufacturing processes as it can withstand the high temperatures without being damaged. This would allow the flexible, very thin batteries to be easily added to IoT nodes by being laminated into the PCB, especially where they use energy harvesting. The technology has already been used to manufacture more than 10 million batteries, and the company is evaluating additional funding from other parties interested in investing. The acquisition of Fairchild by ON Semiconductor sees one of the founding names of the electronics industry disappear. The details, including the new structure of ON Semi, are at EETimes Europe. It's part of the continuing consolidation of the power industry as it matures such as the acquisition of Linear Technology by Analog Devices back in July. The Industrial Internet of Things is unique in that devices that compose industrial control systems are often insecure due to limitations in their design and capability. On top of that, the protocols used to communicate are not secure, with a dangerous reliance on physical security, such as keeping devices on a local network). 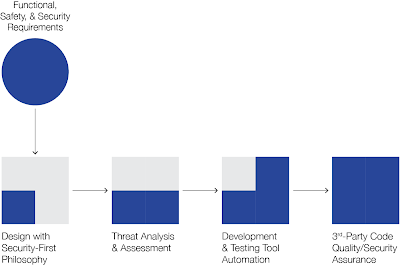 System-level implementation of security is required as part of that secure software design and development. Industrial devices suffer the same challenges as all IoT devices, such as being increasingly targeted by attackers, having traditionally poor built-in security, and having large deployments of legacy devices, all while increasing machine-to-machine connectivity. use advanced source and binary code analysis to ensure the quality and security of third-party code. After years of development, magnetoresistive RAM (MRAM) looks set to become a standard technology as it rolls out on the 22nm process technology from GLOBALFOUNDRIES. The move will allow lower power IoT chip designs coming to market in 2018. GLOBALFOUNDRIES had been working with startup Everspin Technologies, and has now introduced a scalable, embedded MRAM non-volatile memory technology (eMRAM) on its 22FDX platform. This provides embedded system designers with access to 1,000x faster write speeds and 1,000x more endurance than today’s non-volatile memory (NVM) offerings. 22FDX eMRAM also features the ability to retain data through 260°C solder reflow with an industry-leading eMRAM bitcell size. The 22FDX platform is the industry’s first 22nm fully-depleted silicon-on-insulator (FD-SOI) technology which enables the MRAM capability for both code storage (flash) and working memory (SRAM). The power efficiency of FDX and eMRAM, coupled with the available RF connectivity IP, makes 22FDX an ideal platform for battery-powered IoT products and automotive controllers. The partnership with Everspin has already delivered the world’s highest density ST-MRAM in August, 2016 with a 256Mbit DDR3 perpendicular magnetic tunnel junction (pMTJ) memory chip that is being readied for mass production. The 22FDX eMRAM is currently in development and is expected to be available for customer prototyping in 2017, with volume production in 2018. GLOBALFOUNDRIES’ eMRAM technology is scalable beyond 22nm and is expected to be available on both FinFET and future FDX platforms. 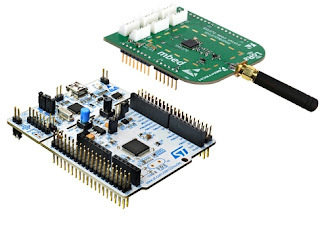 STMicroelectronics has introduced a low-cost development kit that uses the STM32 microcontroller ecosystem for prototyping Internet-of-Things (IoT) devices with LoRa Wireless Low-Power Wide Area Network (LPWAN) connections. Weightless launches long range IoT basestation and development kit.. The $40 P-NUCLEO-LRWAN1 kit (above) combines the ultra-low-power STM32L073 Nucleo (NUCLEO-L073RZ) microcontroller board with an RF expansion board based on the proven SX1272 LoRa transceiver from Semtech (I-NUCLEO-SX1272D). The STM32L073 MCU is based around the ARM Cortex-M0+ core and proprietary ultra-low-power features for devices such as utility meters, alarm systems, positioning devices, trackers, and remote sensors. Users can further extend functionality by adding extra expansion boards, such as the X-NUCLEO-IKS01A1 sensor board for motion, humidity, and temperature sensing. LoRa enables long-range communication with several advantages over conventional cellular connections, including lower power and cost. Versatile features include multiple communication modes, accurate indoor and outdoor location awareness, and native AES-128 security. This competes with technology from SIGFOX and the new Weightless-P standard. The new kit contains everything needed to build bi-directional end devices that comply with LoRaWAN version 1.0.1 and support class A and class C protocols. Devices can be activated using Over-The-Air Activation (OTAA) or Activation-By-Personalization (ABP). An application for LoRaWAN certification tests is included in the kit, and the I-CUBE-LRWAN LoRaWAN stack is available and posted at www.st.com/i-cube-lrwan. Using the STM32 ecosystem provides development resources such as the STM32Cube tools and software packages containing sample code and Hardware Abstraction Layers (HALs). These allow porting to any of the almost 700 STM32 MCU variants that cover a wide range of performance, power, packages, and price points. Developers are also free to use familiar IDEs and ARM mbed online tools. 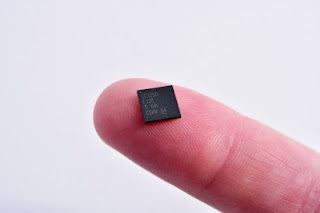 Texas Instruments has launched a dual-band wireless microcontroller (MCU) that supports sub-1 GHz and Bluetooth low energy connections on a single chip for under $5. The SimpleLink dual-band CC1350 wireless MCU enables developers to move from a three-chip solution to one, reducing design complexity and saving power, cost and board space. The sub-GHx capability gives the CC1350 a range of up to 20 km on a coin cell battery for building and factory automation, alarm and security, smart grid, asset tracking and wireless sensor network applications, while the Bluetooth connection gives an easy link to a node via a smartphone or tablet. The device is based around an ARM Cortex-M3 core in a single, Flash-based, 4x4 mm QFN package with a sleep current of 0.7 uA that allows for more than 10 years of battery life. Developers can get started quickly with the low-cost CC1350 wireless MCU LaunchPad development kit or connect sensors to the cloud in minutes with the CC1350 SensorTag demo kit supported by TI’s Code Composer Studio integrated development environment (IDE) and IAR's Embedded WorkBench. TI has also simplified development by providing multiple software options including point-to-point communication examples with EasyLink, a wireless M-Bus protocol stack leveraging TI RTOS, as well as the BLE-Stack 2.2 software development kit (SDK) which supports Bluetooth 4.2 specifications. This small, sensor-based kit includes 10 low-power MEMS sensors and can connect to the cloud in less than three minutes. The LaunchPad kit (LAUNCHXL-CC1350) costs $29.00, the SensorTag demo kit (CC1350STK) coming in 4Q 2016 for $29.99. The SimpleLink Sub-1 GHz CC1350 wireless MCUs, for operation in 315 MHz, 433 MHz, 470 MHz, 500 MHz, 779 MHz, 868 MHz, 915 MHz and 920 MHz and 2.4 GHz ISM bands and SRD systems, will be available in 4x4, 5x5 and 7x7 mm QFN packages.